A new research report projects the overall future of the global CCTV Camera market. The demand for CCTV cameras is at a rise, which has led to an impact on the global CCTV Camera market. 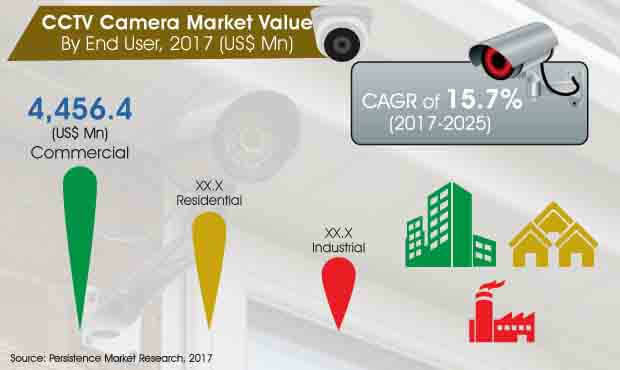 This comprehensive research report is a systematic projection of the market dynamics, market share, pricing analysis and the CAGR for the global CCTV Camera market during the forecast period 2017-2025. It gives an insight to the market scenario with the help of an exhaustive research program conducted by a team of industry experts. CCTV camera being a product that is widely used, its market analysis can be a complicated process. But, this comprehensive research report has simplified the process to a great extent and can even help the businesses get the highlights of most lucrative regions all over the world for CCTV camera sales. The report includes a detailed analysis of different regional markets. The regional analysis briefs the scenario of the market along with the dynamics impacting revenue growth. To give a clear understanding of the market, the report comprises a market segmentation that bifurcates the market into different segments based on various parameters. Here’s the detailed segmentation of global CCTV Camera market. The structure of the global CCTV Camera market report takes a systematic approach. It begins with the summary of the market analysis that just gives the highlights in the form of market CAGR and market share. It is followed by a detailed definition of the market and the products. It also includes the segmentation and a section dedicated to an individual analysis of the segments along with the dynamics of the particular region. Another important section of the report is the competitive analysis of the global CCTV Camera market. This presents the readers with a brief profile of all the key players in the industry along with their current market strategy and upcoming market plans. The competitive analysis can be of great help to the current as well as the new entrants in the market to help them mark their presence in the market and compete efficiently. The team of analysts who have worked on the preparation of this report have left no stone unturned to get each and every insight of the global CCTV Camera market. Their aim is to guide you with the most important dos and don’ts so as to ensure your success in this industry. The data provided in the report is made sure of its accuracy with the help of a triangulation method wherein, the secondary and primary data along with our independent analysis is consolidated to develop the final report. The end result of the report is also based on various interviews with industry specialists and experts who have added a great value to the analysis by contributing their knowledge of this market. Physical security is the type of security associated with safeguarding personnel, property, or information in business organizations, residential and industrial applications, and sectors such as retail, utilities, and energy etc. Infrastructural development and growing security concerns caused by the rising number of terrorist activities have led to the development of innovative physical security solutions. This is expected to help the CCTV camera market grow at an exceptional rate during the period 2017-2025. The CCTV camera market is growing rapidly due to a technological shift from analog video surveillance systems to network camera solutions. Companies need to focus on manufacturing a variety of network cameras that are in huge demand in various industry verticals. Among various end users of CCTV cameras, the residential sector is expected to witness increased preference towards CCTV cameras. According to the market analysis, the residential segment is expected to grow at a CAGR 17.8% during the forecast period, which is the highest among all other end users of CCTV cameras. However, in terms of market share, the commercial sector dominates the global CCTV camera market. The commercial segment is expected to reach a market size of over US$ 13,100 Mn by the end of 2025. The advancements in technology are driving the growth of the global CCTV camera market. The introduction of 4K cameras and advanced security camera technology are adopted in different sectors in order to ensure security against threats, shoplifting and terrorism. This factor helps in driving the growth of the CCTV camera market. The internet of things (IoT) is also playing a major role in CCTV camera related advancements and is contributing to the growth of the global CCTV camera market. The newer digital cameras are much more convenient than the traditional analog cameras. Network Cameras are digital video camera with a built-in Ethernet network connection and a web server. The digitally compressed video from the camera can be seen immediately from all computers that are connected to a network. Analog cameras are physically connected to monitors and recording devices using coaxial cables. The worldwide retail sales of CCTV cameras is increasing significantly every year. The rise in retail sales is also a result of continuous increasing population as well as disposable income in the last few years. The global CCTV camera market is at a hike and is expected to continue growing during the forecast period 2017-2025. However the market is also expected face a few hindrances in revenue growth. One of the major restrictions the CCTV camera market may face is the high costs associated with the new technologies introduced in the global market. The newer costly cameras come with IP/Network facilities, which is not affordable to every end user. The HD cameras and 4k cameras are also costly especially for a normal residential use. This factor may restrict the growth of the global CCTV camera market. There are also rising concerns over people’s privacy that is interrupted by excessive use of CCTV cameras worldwide. These concerns may restrict the use of CCTV cameras in certain areas, lowering the scope of business for CCTV camera manufacturers.